We have ribbon for many different printers. Here is a list of common printers, just ask us if you need more info. 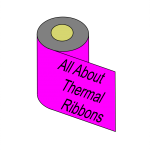 Thermal transfer ribbons are a single use ribbon. To calculate how much ribbon you need to print your labels you can use this simple method. Firstly measure the height of one label and add the gap between labels. Lets say the label height was 28mm and there was a gap of 2mm, this would be 30mm. What you need to is divide this height into the ribbon length. 300 divided by .030 = 10000. You can print 10,000 labels approximately with this ribbon.